Among investors with a net worth of $25 million or more, personal trust ownership has risen over the past two years. Among all influent investors, however, trust ownership is waning yet again. According to Spectrem’s latest iteration of its study on investors with a net worth of at least $25 million, 91 percent of those investors own at least one trust. According to the 2016 report, only 88 percent of $25 million plus investors had assets in a trust, indicating some growth among that wealthy segment of investors over the past two years. The number of $25 million plus investors has grown as well. According to Spectrem’s 2018 Market Insights report, there are 172,000 Americans with a net worth over $25 million, and that number rose by 18,000 over the previous year. Since the Great Recession in 2008 reduced so many portfolios, the number of $25 million plus investors has more than doubled in 10 years. But Spectrem’s 2018 Comprehensive Bank Trust Update, released in November, shows that trust ownership among all investors is down for the eighth year in a row. From almost 790,000 personal trust accounts in 2009, the actual number of trusts has dropped to 556,142, a decrease of more than 230,000. In 2017, trust assets actually rose for the first time in three years to $964 billion, still well below the high of $1.149 trillion in 2007. Despite the downturn in overall trust numbers, the rise among $25 million investors indicates that investors with significant wealth still use trusts as a way to protect their estate and prepare it for transfer. But the details surrounding the trust usage tell a tale of interest to bank trustees and advisors who work with bank officials. According to The Wealthiest Americans, of those $25 million plus investors who own a trust, 80 percent own more than one, and one-third own at least four trusts. Separate trusts can be established in order to protect one class of assets from others for legal or tax purposes, can be used to separate beneficiary plans depending on wealth transfer decisions, and can also provide privacy related to varied assets. 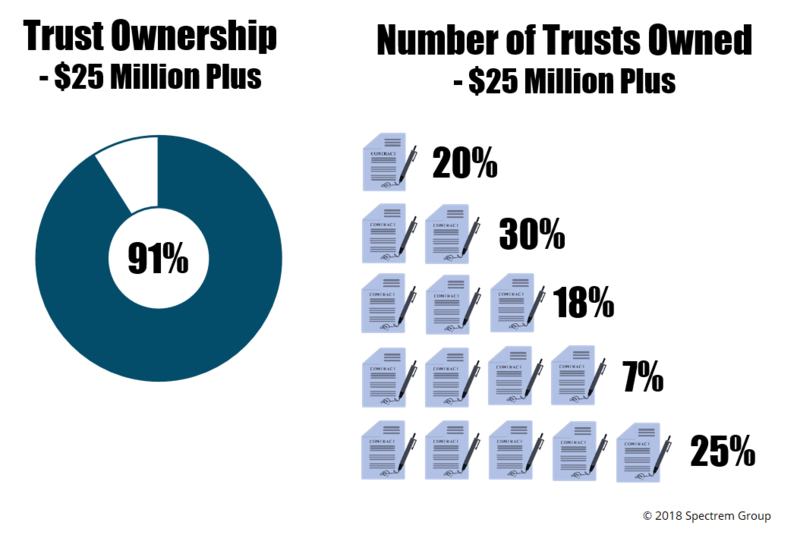 Now the bad news about those trusts, from a bank trust officer standpoint: Only 17 percent of the trusts held by $25 million plus investors is serviced as trustee by someone from a financial institution. It is far more likely (63 percent) that a spouse serves as trustee, or a child (46 percent), or the grantor themselves (21 percent). The percentage of financial institution officials serving as trustee upon the death of the grantor drops to 13 percent, as many of those duties are turned over to a spouse or child upon the death of the grantor. The $25 million plus investors who utilize a trust to protect assets do so for a majority of their assets, according to the Spectrem study. Twenty percent of the trust owners have at least 76 percent up to 100 percent of their assets held in the legal structure of a trust, and 40 percent have between 51 percent and 75 percent held in a trust. That level of usage can play a role in the growing total assets held in trust nationally while the actual number of trusts drops on an annual basis. Many investors appreciate the protections that come from placing assets in a trust. But few of them trust financial institutions to care for the trusts in a way that makes it financially reasonable to assign those assets to them rather than have a family member (or themselves) administer the trust. As with many other aspects of the advisor role, education plays a role in getting grantors to consider using a financial institution as their trustee. The advantages do exist and can be explained in a way to make them attractive to investors. The best way to do that is to discuss the concept with investors who are already clients but who have not yet moved assets into a trust, allowing advisors to compare the two methods.